You can move or copy contacts between workflow by using, respectively, Move to workflow and Copy to workflow actions. Copy to workflow lets you add your contacts to another active workflow. This means that your contacts can complete more than one workflow at a time. Use Move to workflow to remove your contacts from one workflow and add them to another. 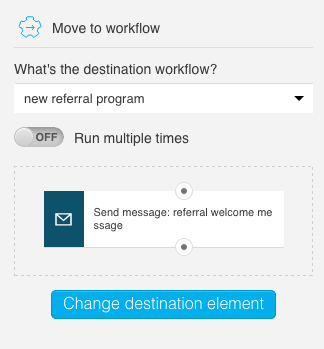 Effectively, the contacts who reach this element only complete the workflow you move them to. Use these actions to better target your contacts and to reach just the right group of people. For example, if your contacts keep not opening your messages in one workflow, you can move them to another workflow that relies on a different marketing strategy. How do I use Copy to workflow and Move to workflow? When you use Copy to workflow and Move to workflow you work with two workflows: a source workflow (the workflow you’re moving your copying your contacts from) and a target workflow (the one you’re moving or copying your contacts to). Be sure that the source and target workflows are scheduled correctly. The target workflow can’t stop working before you add or move contacts there from another workflow. When you’re setting up Copy to workflow and Move to workflow, your target workflow opens automatically in a separate window. So, you don’t need to manually open multiple tabs or drag and drop new elements to your target workflow. Just make sure your target workflows are active; that is, you’ve toggled them to ON. Otherwise, you won’t be able to find them on the list of available workflows. Add the element to your workflow and open the Properties. Under Properties, expand the list and select which workflow you want to move your contacts to. 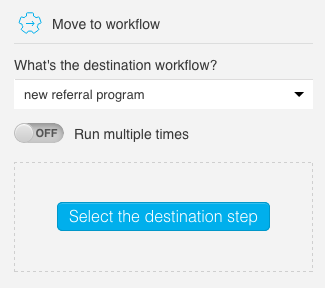 Then, click Select the destination step to open your target workflow and finish setting up the element (the target workflow opens in a separate window). The new window shows your target workflow and a new Move from workflow element that works like a connection point between your workflows. Connect Move from workflow to the element you’d like your contacts to advance to. Click Save. This saves the changes in the target workflow and takes you back to your source workflow. 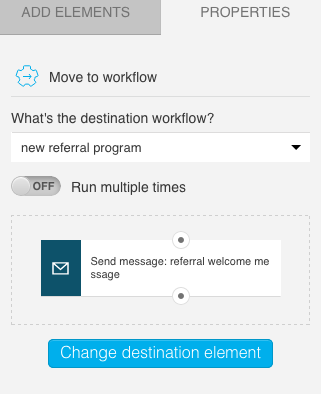 The Move to workflow Properties now display the action your contacts advance to in the target workflow. 6. When you’re done building your source workflow, click Save and publish. Add the Copy to workflow to your workspace and go to the element Properties. Then, proceed with steps 2-5 you followed for setting up Move to workflow. Note: Unlike Move to workflow, Copy to workflow has a bottom connector. This means you can link more elements to it in the target workflow and your contacts can advance both in the source and the target workflows. How do I change how I move or copy contacts to workflows? If you’d like your contacts to advance to a different element in the target workflow, simply click Change destination element and repeat steps 3-6 to make any necessary changes. If you change your mind and decide to move or copy your contacts to a different workflow, simply follow steps 2-6 described above. Any changes you’ve made to the “original” target workflow are reset; meaning, the connection between the workflows is no longer there. If you decide to stop adding or moving your contacts to another workflow, delete the Move to workflow or Copy to workflow elements in the source workflow. This removes the Move from workflow or Copy from workflow elements in your target workflow.